AFTER: Though not what I was looking or hoping for, Field of Dreams was a great way to end the baseball chain. In yesterday’s review of Bull Durham I described what a good baseball movie should be. To me a baseball film should put the focus solely on the games, practices, etc. and then have a intriguing secondary story to tie everything together and give a sense of purpose for watching the film instead of a real-life game. Well today I’m going to backtrack a bit on that statement. Based off my experience this past month you don’t actually get the thrill of watching an exciting game of baseball in the movies; it’s not the purpose. The purpose is to have a good story with baseball being one aspect of it. Maybe I was a bit naive to mainly want good gameplay because I didn’t really get that in any of these films. For that I would recommend watching ESPN’s 30 for 30 film Four Days in October: a retelling of the unprecedented Red Sox comeback in the 2004 ALCS. So what does that mean for Field of Dreams? Well, it was a great film about one guy, Ray Kinsella (Kevin Costner) and his quest to find a purpose for being. This purpose is to build a baseball field where baseball players of old can come to relive their glory days. It’s a great idea and it deals with many of the founding principles and stories of the sport, the central one being Shoeless Joe Jackson and the Black Sox scandal. But again the issue of believability comes into play. It’s not the reincarnation of dead people that’s the problem, it’s the fact that Ray, his wife, daughter, and a handful of other people treat this as if nothing is odd. Besides Ray repeatedly saying he’s not crazy but he could see how people think that, no one who sees the players questions how it is possible. No one addressed the elephant in the room and as a result, it’s a bit awkward for the entire film. The verdict: while I didn’t find the perfect baseball film, I did watch some pretty good ones. The Bad News Bears (the 1976 original) was by far the best comedy and Bull Durham takes home the best drama. 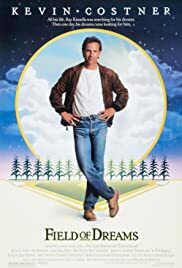 Field of Dreams is a close second for the drama category but the premise is just too implausible without a satisfactory explanation.